it was about to rally. This initial rally could be part of a longer term move. several economic cycles. Gold is used as a hedge against market uncertainty. Stock market uncertainty seems to be one of the reasons for the rising prices in gold. because of shorter term cycles. This seems to be the case with the current turn. 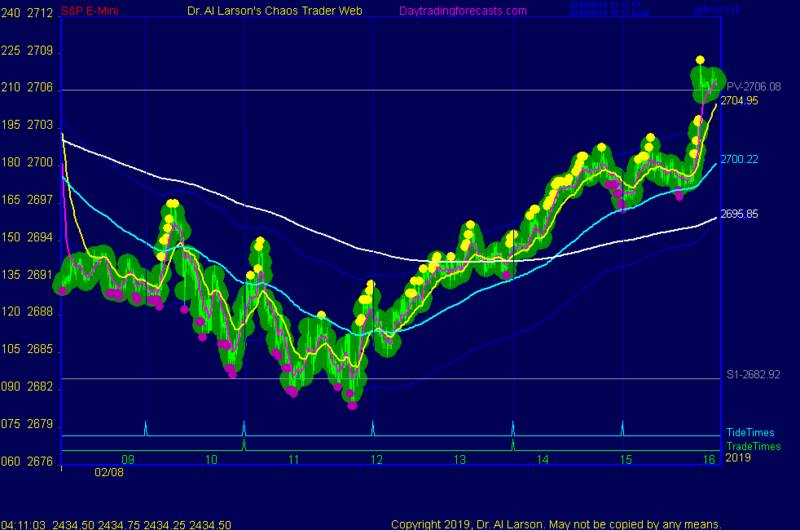 However, this can be helped by using longer term exponential moving averages. near a price of 120. These EXMAs are higher than they were two years ago. term cycle is turning up. Cycles tend to have equal time moves. An up SO cycle could run into the end of 2023.
during the next 5 years, they could go much higher. For investors holding GLD, the guide line should be to stay long as much as possible. while using prudent stop loss methods. A strategy of buying the dips may also work. 2/8/2019 11:22:17 AM MT Al****:: to graduates of my 4 main courses. See http://moneytide.com -> Courses for details. 2/8/2019 10:02:34 AM MT Al****:: thank you GON. Hope all is well with you. Be sure to get the Earthing book. It would be a good addition to all those energy traps. 2/8/2019 9:51:24 AM MT gon:: Good afternoon everone, hi Al. Your AUX article, published as usual: https://www.fxstreet.com/analysis/long-term-outlook-for-gold-201902081648 Thank you very much. 2/8/2019 8:06:10 AM MT Al****:: Ahab, you're having a heat wave ! 2/8/2019 7:34:28 AM MT Ahab****:: In St. Louis...12 degrees...-2 wind chill.